I was born in 1951, and since 1980 I have lived close to the shores of beautiful Morecambe Bay in the North West of England. To me, on a clear day there is no finer view across a bay anywhere in Great Britain, as that of the mountains of the Lake District, particularly in the winter when they are shining white under a blanket of snow. For most of my life I have been passionate about the countryside and have spent many days exploring the valleys and climbing to the summits of the mountains and hills of the Lake District, Yorkshire Dales and Howgill Fells. Long may my legs enable me to continue doing this too! I am fortunate too, that I have two good friends Eric Bartlett and Bob Woolley who separately accompany me on some of my outings. Eric, who lives nearby in Kendal in Cumbria, I met through work and we started walking together in 1993. Over the years we have shared many walks exploring the Lakeland Fells, Howgills and the countryside of Cumbria and North Lancashire. Bob I met by chance on Fellbarrow in the North Lakes in 2005. We have since become good friends and shared many an adventure together first in the Lakes as we each completed the Wainwright Fells. 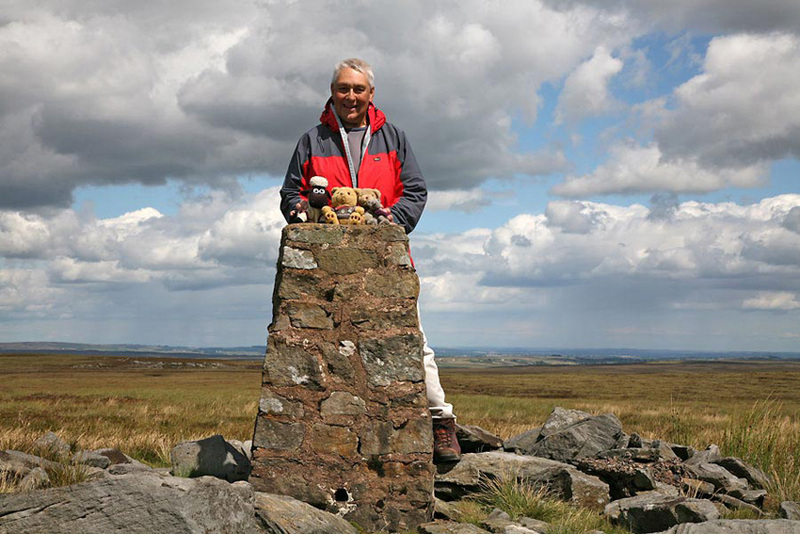 From the end of 2006 we started a project to climb to all the summits in the Yorkshire Dales. To date out of the about 114 tops we have done 112. One of my other passions has been the collecting of soft toys, primarily teddy bears. It all started very innocently with just one bear named Gladly. At the last count my Hug (the collective name for teddy bears) had reached 500. Bear lovers will tell you that teddies develop their own characters. So unsurprisingly five of my Hug have become regular companions on my walks, with their heads poking out of my rucksack of course, as I walk along. Whilst their walking club is called "STAG", after the initials of the names of the four original members, they are generally referred to by their human walking companions as "The Lads". They asked me to transcribe the stories of some of their adventures, which I hope you enjoy.